In towns and cities across Europe, our bridges and rivers provide a rich history of our trade, culture, and humanity. Sadly, in recent years their beauty can become overshadowed by anxiety and tragedy. In the city of Galway, the powerful Corrib ebbs and flows through the city, past Wolf tone and William O'Brien bridge and beyond. For some, there is another association with this river - pain. However, hope is returning as the conversation surrounding mental health and our need to build community supports moves throughout the country. One project, in particular, involves a partnership between Galway 2020 European Capital of Culture and Galway Community Circus on a project called Wires Crossed. This innovative project aims to promote physical and mental wellbeing, safe risk-taking and social inclusion through the art of highwire walking (or funambulism as it is known). 400 people of all ages and backgrounds will be trained in this elegant circus skill cumulating in a spectacular river crossing in August 2020. Craig Flaherty cultural producer of Galway 2020 explained: "Wires Crossed presents an opportunity for us to change our perspective about our relationship with the Corrib and mental health through an extensive program that Galway Community Circus will roll out over the next two years". In January, I was invited to deliver a mindfulness session on one of the Wires Crossed workshops, as part of First Fortnight, the mental health festival. I also got an opportunity to learn the basics of funambulism as part of my preparation and now see lot of common ground with mindfulness. When I first stood on the wire, I instantly noticed doubts about my balance, fear of falling (we were training less than two feet off the ground) and wanting to rush through the walk just to finish it. However, by focusing my attention, connecting to sensations in my feet and slowing down I got to really enjoy the process. It’s a fun, meditative and active way to experience mindfulness. Twenty people attended the First Fortnight workshop, the first half was spent experiencing mindfulness practices and the second half learning the basics of wire walking. It became clear that the lessons being learned on the wire could help walkers in their everyday lives. I observed people of all ages really slow down and find a relaxed focus, peace and confidence on the wire as they overcame the same doubts and challenges that I had. During a break Phillida Eves shared her experience of the workshop "I find mindfulness tricky, sitting in the chair but when you’re on the wire you can’t do anything else. if you try walking the wire with your head buzzing you won’t get anywhere, it forces you in the nicest possible way to focus and its very freeing". Wire walking may take us way out of our comfort zone but in a safe way, and with a great support team of Galway Community Circus Tony, Aidan, Sandra and Eoghan. 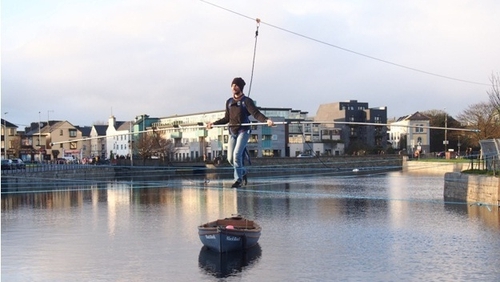 Martin Nolan a volunteer in the Galway waterways patrol, was drawn to the project because of its community focus and using wire walking as a tool for healing and changing how he sees the river. "We are going to show people how to cross a bridge on a tightwire, it’s something I would fear myself, having to walk across a tight wire, if I could do that, I could confront things that were holding me back"
Phillida's also spoke of her motivation for getting involved beyond the enjoyment factor "This project is very important to me because the river in Galway is a beautiful place but also a place of terrible sadness, some of me hates the river and this project is about doing something as part of a community with the river in the Centre". You can also be part Wires Crossed and work towards creating a future of improved wellbeing, either by putting Galway 2020 into your calendar and come along to support the walkers or get in touch with Galway Community Circus and attend one of their amazing workshops to learn this art form where mindfulness meets circus.